Before the epigones take over the stage we are given a chance to hear out Bach himself: the unfinished four-voice Contrapunctus XIV from the Art of the Fugue marks the starting point of Andreas Grau's and Götz Schumacher's remarkable exploration of the Bach cosmos. In the Berlin autograph of the Contrapunctus XIV the place where the score breaks off is marked by an inscription: "At the point where the name BACH is introduced in the countersubject to this fugue, the composer died." Even though from today's perspective it appears doubtful that Bach indeed toiled over this composition until the very end, the silence setting in at this moment never fails to move the listener. 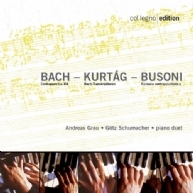 Many have attempted to finish this fugue, some in Bach's style, others in an excessive, even though modern manner, such as Ferruccio Busoni. In the final part of his Fantasia contrappuntistica Busoni constructed a five-voice fugue of a strictness and, at the same time, a pianistic excessiveness that have no equal. And in marked contrast to Busoni: the wonderfully spiritualized, enraptured adaptations by Kurtág, filling Bach's music with truly celestial essence. Both adaptations are valuable explorations into the music of one of the greatest geniuses in the history of music. Last things and Christian visions: György Kurtág’s reflections on Heinrich Schütz, and Olivier Messiaen in search of the "Amen."